MuzoBlog is not typically a port of call for catching up on retailers' or distributors' special offers. However, very occasionally, a bargain will come a-romping to the field, horns waving, flags blaring, making like a mountain troll at the gates of Minas Tirith - ie, a conspicuous no-brainer you'd be daft to resist. 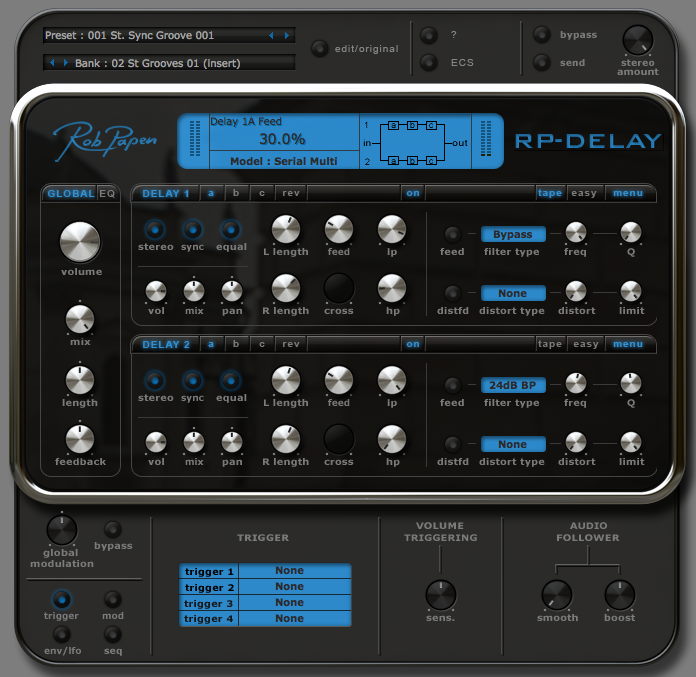 That's not to say Rob Papen's RP-Delay smells of squished orc. 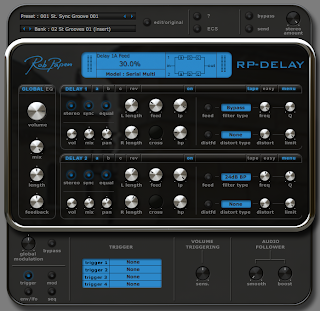 On the contrary, this AU/VST/RTAS plugin, along with its comrade in ambience RP-Verb, is well precious. I'll leave it to Papen to point out the pertinent, such as extensive modulation implementation, the means to reverse reflections as you like and even simulate the characteristics of tape delay. Let’s just say that from now until 30 November, the download from UK distributor Time+Space will cost you but £10. 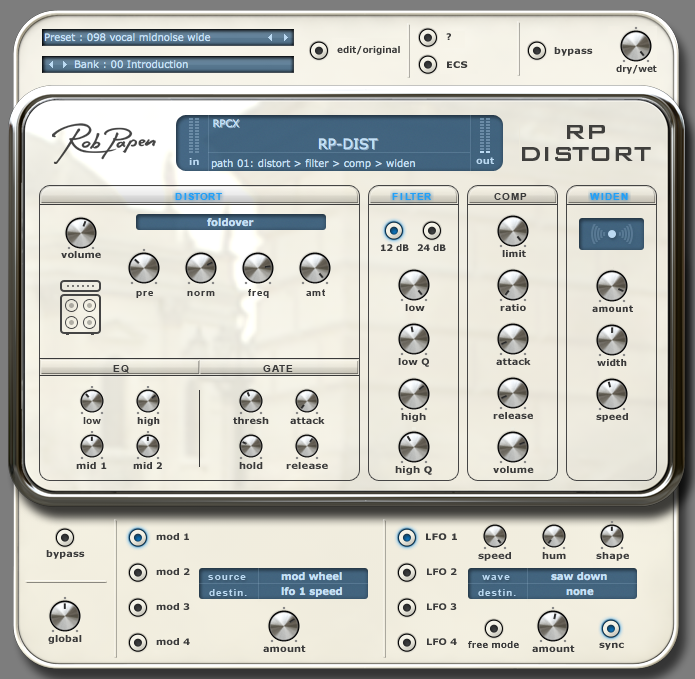 That's right, T+S is offering RP-Delay for 10 measly quid (or €12 in foreign) and, on registering the product with the developer, you get a free copy of RP-Distort. So, two juicy plugs that would otherwise retail for €98 in total (or $138 in the currency of a certain British colony that celebrates Thanksgiving, or some such) can be yours for the price of a small-ish turkey. I happen to know that both effectors are particularly fruity because both are deployed in The Surgery, MuzoBlog's test facility, and are gaining much favour. The AU and VST incarnations are 64-bit (as well as backward compatible for 32-bit environments), hence multiple instances can be loaded on multi-core, well RAMmed computers with impunity ready to echo and distort programme material into whatever space or state of distress is appropriate. In lieu of a more comprehensive MuzoBlogpost on each, like wot I wrote for Papen's RP-Verb in September 2010, I'll point you to RP-Delay's and RP-Distort's product pages at the developer's site for a take on the headline features and audio examples a-go-go. So ready your plastic and prepare to poke T+S's shiny new servers. But do hold something back for the rest of Black Friday, mention of which is possibly confusing my UK audience by now. OK, an explanation. Thanksgiving is an annual US-centric phenomenon that falls on the fourth Thursday of November. Americans see it as an occasion to be with family, eat turkey, exchange gifts and forget what the holiday symbolises. In that sense, it’s rather like Christmas Day in much of the Western world - a festival of copious consumption and consumerism. That and something to do with religion. The day following Thanksgiving, Black Friday, sees Americans pound, Grond-like, on the doors of shops offering mega discounts on their wares in order to kick off the holiday season. As such, it helps to ensure that retailers end the calendar year in the black, hence the name. Perhaps. And does it ever kick off - like Boxing Day with guns. Then again, it's a tad more civilised than the 'start an ad hoc riot, Blackberry it to mates, kick in shop windows, grab shiny things and torch the place' model that's been so popular in the UK this year. I digress. The neat thing is that Black Friday sales tend to last a whole week (in fact, online muzo-training outfit Groove3 has pitched in with an entire Black November gaggle of goodies, including an all-year pass to its tutorial vids for $99) and, if buying music-tech downloadables from the States, we get access to discounted stuff sans shipping. Of course, we’re still liable for VAT and ever do we declare it to HMRC via reverse charge. Don’t we? Yes, we really, really do. Ahem. It pays, therefore, to keep a wary eye on non-EU, muzo-friendly developers' websites in this last week of November. And what better excuse is there to justify diversion of some of your Xmas pressie budget to yourself? 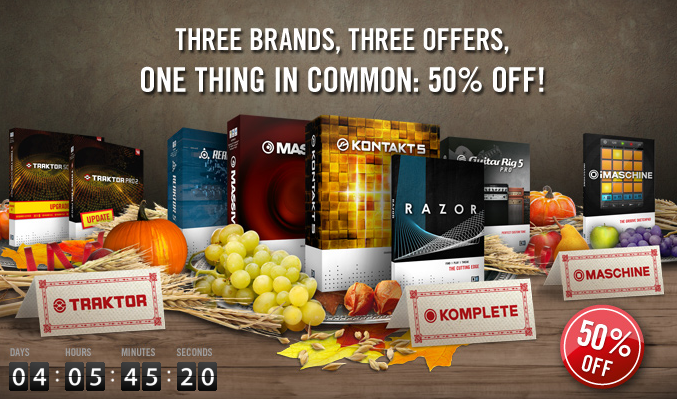 As with many aspects of Americana, the commercial vibe of the Winter holidays is spreading in Europe and one EU-based software house, Native Instruments, is having a Thanksgiving sale until 28 November. It features 50% discounts on some ripping virtual instruments, effects and DJ tools of interest to users of Komplete, Kontakt, Traktor and Maschine. Sadly, you can't use NI discount vouchers in conjunction with the half-price deals, but you do get yet another voucher for use with items not on offer. There are more bargains popping up: Dolphin Music’s BF stocking fillers (which sounds a bit oo-er); Big Fish Audio’s offer of 25% off orders of $199 or more with coupon code TGS25 until 27 November; at least 33% off everything from the store of sample forge Soundiron until 12am CST on 29 November; and deals from DV Music which are so cataclysmically zippy, you have to phone East London store manager James McNeilly on +44 (0)1708 771991 to find out what they might be. That lot accounts for just some of the emails that have arrived in my copy of Thunderbird this Thanksgiving day alone, so thank ye purveyors. I’ll be spending my Black Friday trying not to get too distracted by the wonderful music-making gadgetry that has been arriving on the market recently, nailing down a schedule of reviews up to the year’s end and hopping around the web to see if there are any other unmissable bargains to be had. And there's still Cyber Monday to look forward to. If you decide on a spending spree as the holiday season gets into its swing thing, whiz by the MuzoBlog Community page on Facebook, Like it and let me know what you’ve bought, what you make of it and what you’re gagging for come Xmas. Peace and goodwill to all? Or a neighbourhood-flattening Hughes & Kettner Coreblade head plus MC 412 cab? Have your say this Black Friday.